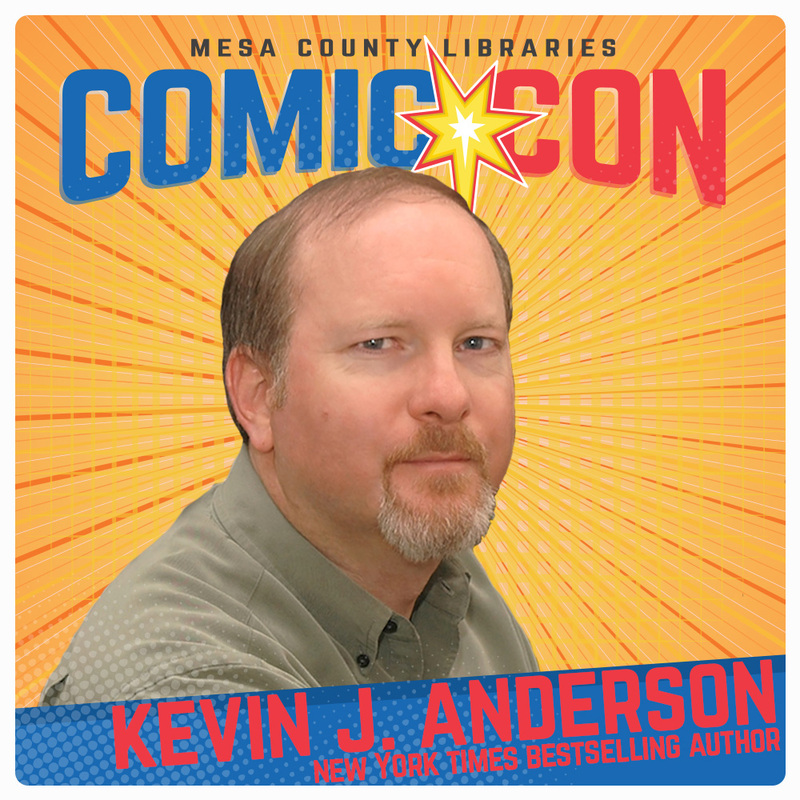 Kevin J. Anderson, a prolific and popular science fiction author with fans worldwide, will headline the 2018 Mesa County Libraries Comic Con set for Saturday, Oct. 6, at Two Rivers Convention Center in Grand Junction. Anderson will speak and answer questions from the audience. He will be available for autographs and book-signings after his presentation. Anderson joins Eisner Award-winning comic book writer Mike Baron, co-creator of the long-running superhero comic “Nexus,” as a special guest at this year’s Comic Con. The 2018 Comic Con will feature a wide variety of vendors and exhibitors, exciting cosplay and costume contests, intriguing panel discussions, fascinating speakers, and more. Anderson’s accomplishments are well-known to science fiction fans. He has published more than 140 books, including 56 national or international bestsellers, with 23 million copies of his books in print in 30 languages. He has written numerous novels in the Star Wars, X-Files, and Dune universes, as well as unique steampunk fantasy novels “Clockwork Angels” and “Clockwork Lives,” written with rock drummer Neal Peart and based on the concept album by the band Rush. Anderson’s original works include the Saga of the Seven Suns series, the Terra Incognita fantasy trilogy, the Saga of Shadows trilogy, and his humorous horror series featuring Dan Shamble, Zombie P.I. He has edited numerous anthologies and written comics, games, and the lyrics to two rock CDs. Mesa County Libraries Comic Con is set for 9 a.m.-5 p.m. Saturday, Oct. 6, 2018, at Two Rivers Convention Center, 159 Main St. in downtown Grand Junction. Last year’s Comic Con attracted more than 5,000 people, and this year’s attendance may be larger yet. Admission to this year’s Comic Con will be free of charge to anyone with a Mesa County Libraries card, or a $5 donation per person for non-cardholders. Mesa County Libraries urge anyone with an interest in Comic Con to get your library card TODAY at any library location. Library cards are free of charge. Not only will your library card get you free admission to Mesa County Libraries Comic Con, but it will open worlds of information and discovery at your local public library. Join us for Mesa County Libraries Comic Con on Saturday, Oct. 6, at Two Rivers Convention Center! Posted in General, Library News, Programs/Classes.